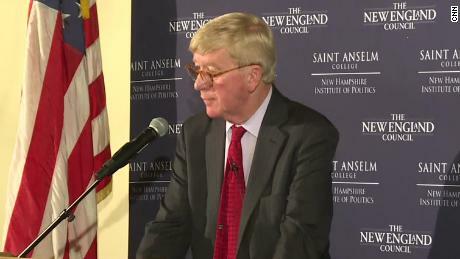 “If I can show well in New Hampshire, even win the New Hampshire primary, that has kind of a domino effect on other primaries around the country — almost an electrical effect,” Weld said. “Mr. Trump and California don’t seem to get along well. I think there’s some real promise there,” Weld said of the blue state, pointing to its new early primary date. He argued that he “could do well” in Wisconsin, a state Trump won in the general election in 2016 but where Republicans lost the governor’s seat last year. “My strategy that I just laid out for you, that’s a strategy to win, that’s not a strategy to weaken anybody. I’m in this, I think, for the best reasons,” Weld told CNN. Weld’s challenge to bump Trump from the GOP nomination is a long shot and primary challenges to a sitting president have largely been unsuccessful. His polling numbers point to a tough uphill battle. Only 8% of Republicans and Republican-leaning independents said they would definitely support Weld in a matchup against Trump and 10% said they weren’t sure but could support him, according to a March poll conducted by Monmouth University. Weld ran in the 2016 presidential election as the vice presidential candidate on the Libertarian Party’s ticket with Gary Johnson.